The Green Man in Euston has stood at the junction of Marylebone Road and Portland Place for over 300 years, making it the oldest pub in this historic and artistic area of Fitzrovia, London. 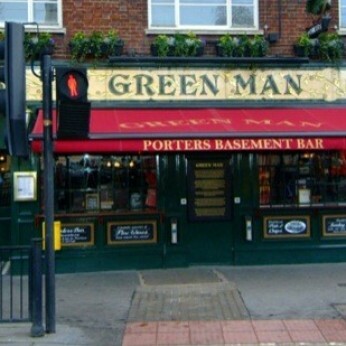 The Green Man pub is a traditional British London pub in Euston serving great freshly cooked traditional pub food. We also serve a fantastic range of beers from around the world, warming red and crisp white wines and a fantastic selection of spirits, and situated next to Great Portland Street tube station in London NW1. London itself has 30 pubs with name Green Man. The original name comes from images in churches of a face peering through made of leaves and petals. But, the Green Man in more modern times is associated with Robin Hood and his men dressed in Lincoln green cloth. Euston Road, which the pub sits on, is part of the 'New Road' from Paddington to Islington and was opened in 1756. It was London's first bypass through the fields to North London. Originally the road was built to provide a route for sheep and cattle to be driven to the famous Smithfield Market and for this reason the road ended at Islington where it joined the existing St Johns Street. Euston Road links onto Tottenham Court Road and during the 1960s office developments grew around this junction including the Euston Tower skyscraper that now forms part of Regent's Place, attracting a number of significant tenants, most notably the former ITV broadcaster Thames Television who had its corporate headquarters there, as well as a number of other studios from 1970 to 1993.The road provided a quicker route for army units to exit London.